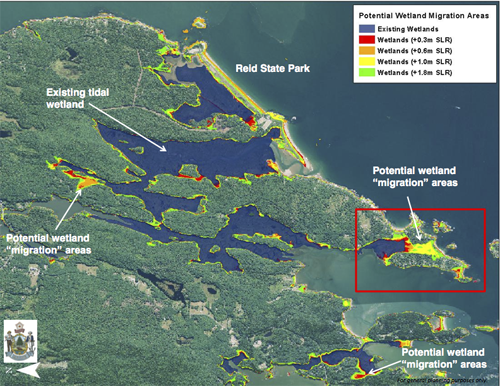 A Marsh Migration Team is helping coastal communities in Maine explore how local policies or plans might address the expected inland movement of coastal marshes as sea levels rise. This collaborative effort involves staff of the Maine Coastal Program, Maine Department of Inland Fisheries and Wildlife, Maine Geological Survey, Wells National Estuarine Research Reserve, and Maine Coast Heritage Trust (a statewide land conservation organization). With support from a NOAA Project of Special Merit grant, the Marsh Migration Team is working with six Maine communities—Scarborough, Bath, Topsham, Phippsburg, Georgetown, and Bowdoinham—to understand the economic and resource values of coastal marshes; assess likely marsh migration; and develop adaptation strategies (recognizing the potential costs of not planning for predicted sea-level rise). The impacts of global sea-level rise will affect every coastal marsh differently—depending on its shape and setting, as well as the slope of upland areas and proximity of development. Each participating community is getting help determining likely effects in four projected scenarios involving both sea-level rise and storm surge. The towns are also assessing their current land uses and infrastructure to see if those could allow marshes to move.